Hair Advice (+ all things nice) | UK Hair Blog: Jewellery. Going up! I would happily stuff as many bits of jewellery on my fingers, wrists and neck as possible. I love an accessory - Mr T ain't got nothing on me, and I will get on a plane fool! Recently I've been trying out some new accessories in my hair. And I think I've found a new way to wear my jewels. Adding a necklace to a bun, can really add some interest. It's a great evening look - I used my Primark necklace for a burst of colour, and then tried out my tribal style necklace. It reminds me of era hair when jeweled bands and clips used to adorn hair. Earlier this year you may have seen Chanel sending models down the catwalk with pearl studded buns. Earrings are a great way to recreate this look. I'm not saying to use your most treasured earrings, but we all have earrings in the jewellery that have sadly lost their other half! Slightly bend the end of the stud or earring and hook into the hair. Or pop a grip through a hole in the earring design and pin in place. 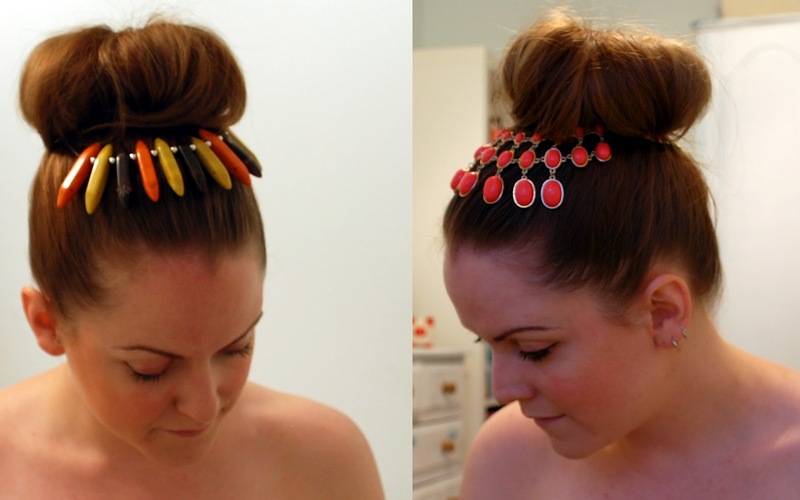 A simple yet incredibly effective way to enhance your hair...and wear more jewellery. Would never of thought of this but that Primark necklace looks amazing as a hair piece!